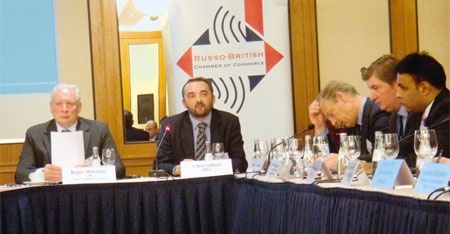 Many fascinating thoughts were provoked and discussed at a recent seminar held jointly by the Russo-British Chamber of Commerce and the National Council on Corporate Governanace. On Tuesday 22nd June, a dozen delegates and a gross of attendees, gathered at the Baltschug Kempinski Hotel to discuss a document presented by the Governance Council entitled Modern Corporate Governance in Russia as seen by Foreign Businessmen and Experts. The debate was chaired by the venerable Roger Munnings, CBE, sometime head of KPMG in the CIS and currently Chairman of the Audit Committee Institute in Russia. Surprisingly, this unpromising format produced a very interesting debate about the important issue of “Russian exceptionalism”. Is Russia part of the world economy on the same basis as most other countries, or is it going to try to set its own rules and avoid full integration into the wider economic environment? Many Russians still cling to the “exceptionalism” which makes dealing with them both fascinating and frustrating, often both at the same time. They do not seem to realise that to play their full part in the global economy, Russia will have to accept the rules of the global business community. A debate is going on today in the Russian business and legal communities which mirrors the nineteenth century divide between the so-called Westernisers and the Slavophiles. “Russian exceptionalism” has a long history. Alexander Ivakhnik of the Governance Council opened the debate by summarising the contents of his document. He gave a refreshingly frank assessment of the state of Russian business attitudes which could be summarised by the old school report cliché: “Good, but could do better”. The good was obvious: more compliance with international business norms, while the darker side of this was the fact was much of what has been achieved has come about only due to pressure from foreign funding sources, principally the London and New York Stock Exchanges. In other words, Russians are often conforming only under protest. Many are not participating in the general spirit of global economic endeavour. They are torn. This is fundamental, as all business is ultimately founded on trust. (The motto of the London Stock Exchange is Dictum Meum Pactum, or My Word is My Bond.) This is a practical problem of enormous importance, but was dealt with by the second speaker with an excursion into Russian philosophic idealism. Evgeniy Kogan represented Third Rome Investment Solutions (the name itself surely reflecting a semi-mystical approach to fianance?). Gospodin Kogan, who looked like one of the more genial executives in Dr No’s underwater kingdom, concentrated less on practical organisational issues like how to build trust in a commercial context and more on what he called “cultural education”. The problem was that Messrs Doeh and Rogan were not just talking two different languages, English and Russian, but in two completely different ways. They both had intelligent and interesting things to say about the same subject, but they could not find a common conceptual framework. Things did not improve as the morning wore on. In the end, it reminded me of a recent account of the weird atmosphere at the Regan- Gorbachev summits in the 1980s. The exchanges at the Corporate Governance meeting were not quite as much at cross-purposes as that, but nearly. Yet at the same time, there was a strange symmetry between the two opposing sides. The “Western” (if I may generalise for simplicity) criticism of Russian business was that it obeyed the rules only when it was profitable to do so. Yet the Russian criticism of Western business is that it only comes to Russia on Russian terms when money is to be made. Both obey local rules when the profit motive calls. Not much difference there. Perhaps Russians have to believe in improvement, if only for the sake of morale. Perhaps Western businessmen have to say they believe in philanthropy, if only to cloak self-interest while operating in democratic societies. These are necessary fictions. Both sides have them. We are similar under the skin. But it is not enough to say that. Unless we can arrive at a common conceptual framework for discussions about even such a simple, practical issue as corporate governance, no serious compromise between the two different approaches to business is going to be possible. Relations between Russia and the West will boil down to a trial of strength about whose images and necessary fictions are the ultimately the more appealing. Does the world prefer Mr Pickwick or Dr No? To put it in Reagan-Gorbachov terms: will the global market vote with its credit cards for philosophy or for Hollywood? And if, as seems likely, the world plumps for Hollywood, what is the point of “cultural education”?